We use a variety of framed marquee structures in different bay widths which allows most marquee site locations to be accommodated be it in a field or a garden. Our marquees can cater for 20 to 480 guests and we provide a professional marquee hire service for both corporate and private events. Call us on 01666 575 470 to hire a marquee for your event. At Malmesbury Marquees we have indepth knowledge of marquees and our attention to detail allows us to accurately gauge the correct marquee size and set up required for your wedding reception, party or event. Our marquees are a modular, aluminium framed design which allows us to construct the marquees to various sizes and shapes to suit your exact requirements and the space available. We can organise everything for your wedding, party or corporate event from toilets to bands, table decorations and special lighting effects as required. Our marquees are all modular aluminium framed pvc covered structures and are available in five different widths 3m, 6m, 9m, 12m and 15m. These structures can all be joined together either parallel, at right angles or end on end using gutter systems. This allows marquee structures to be sized and designed to fit a particular location or allow different rooms to be formed for example a bar area, reception area, dining area, dance floor area and catering area. Our structures can be erected with wooden hard flooring, either our interlocking plyboard flooring which travels with the ground or our levelled wooden floor board system which sits on aluminium extrusions, both of which help on uneven or wet ground or where building the ground level up is the only way of accommodating your marquee. We have 3m x 3m and 6m x 6m peaked pagodas which can be used for either entrances to larger marquees or on their own as garden party structures. Pagodas fit well into small gardens and can make quite a feature when accessorised with creative lighting. To complete your marquee we have wooden French doors and aluminium glass doorsets. With the introduction of 3m high walls to our marquee range we can now create larger and more impressive spaces for entertaining guests at your wedding, festival, party or corporate event. Call us at Malmesbury Marquees on 01666 575 470 to hire a marquee for your wedding, party, festival or corporate event. For a marquee hire quotation or more details, please call Malmesbury Marquees on 01666 575 470 or email info@malmesburymarquees.co.uk. "Malmesbury Marquees provided the marquee for a special birthday lunch in the summer. It was a pleasure to deal with them. 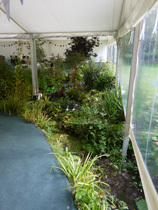 The choice of the size, type and location of the marquee was very straightforward with James's guidance, and the provision of further items was totally painfree. All the arrangements happened on time and as planned. The communications by email and phone were prompt and easy, and even the smallest details were accommodated. We and our guests had a wonderful time. Very many thanks." "Just a line to say thank you to you and all your team for the wonderful set-up of marquees and all that went with it. Your attention to detail and consideration for all of us was second to none. It seems a long time ago that we were standing in the garden in the rain creating the set-up in our minds!"